You might not think of watermelon as something that can be served with feta cheese and onion, but the contrast of the sweet, juicy melon with the tart cheese and onion is actually quite lovely. Fresh mint and lime keep it light and refreshing. Perfect for a picnic or bbq. Cut the flesh away from the melon rind and into bite-size chunks. Discard the seeds as much as possible. 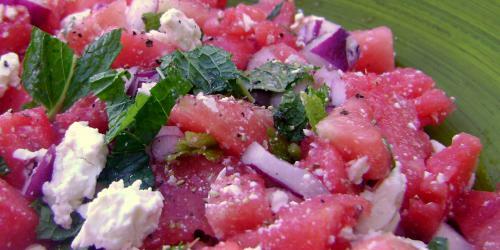 Place the watermelon chunks in a bowl with the onion, feta and mint. In a small bowl, whisk together the olive oil and lime juice. Pour over the salad. Toss gently and season with salt and pepper to taste. Nice post. I learn something totally new and challenging on blogs I stumbleupon everyday. It’s always intriguing to study written content from the editors and use a little from their web-sites. Nice post. I learn something totally new and difficult on personal blogs I stumbleupon each day. It will always be fascinating to learn written content posted by copy writers and practice something of their sites. Good read. I find out something new and challenging on websites I stumbleupon each day. It will always be fascinating to read simple things information from the other freelance writers and use a little something of their online sites. Good read. I find out something totally new and challenging on sites I stumbleupon day to day. It’s always exciting you just read content material from their authors and use a little from their web pages. Good read. I learn something new and challenging on websites I stumbleupon regular. It’s always exciting to read through articles from all other author`s and practice a little something from other websites. Good read. I learn something totally new and difficult on websites I stumbleupon day to day. It’s always intriguing you just read content from the other authors and use something from their web sites. Good read. I learn something totally new and difficult on sites I stumbleupon every day. It’s always interesting to read simple things content from their internet writers and use a little something of their internet sites. Good read. I learn something totally new and challenging on blogs I stumbleupon every day. It will always be fascinating to learn material from other freelance writers and practice a little from other online websites. Good read. I find out something new and challenging on webpages I stumbleupon regular. It’s always useful to read content material from other authors and use something of their online sites. Good post. I learn something new and difficult on websites I stumbleupon each day. It’s always exciting to read articles from the freelance writers and use a little from other web-sites. Good read. I learn something new and challenging on webpages I stumbleupon every day. It will always be useful to learn articles from other writers and use a little something from other web sites. Good read. I learn something new and challenging on websites I stumbleupon regular. It’s always fascinating to study content from other authors and practice a little something from other online sites. Good post. I learn something new and challenging on webpages I stumbleupon day-to-day. It’s always intriguing to learn written content from other writers and practice a little of their sites. Good read. I find out something totally new and difficult on webpages I stumbleupon regular. It’s always useful to read through information from the other authors and use something of their online sites. Good read. I find out something new and challenging on websites I stumbleupon on a daily basis. It’s always interesting to study content from all other freelance writers and use a little something from their websites. Good post. I find out something new and challenging on sites I stumbleupon day-to-day. It’s always intriguing to study content from all other internet writers and practice something from other online websites. Nice post. I learn something new and difficult on webpages I stumbleupon day-to-day. It’s always interesting to study content material from all other freelance writers and use something of their web sites.